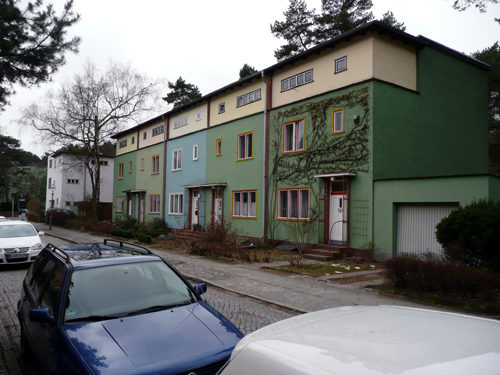 It was in response to a major housing crisis that the city of Berlin initiated an extensive building programme in the 1920’s. 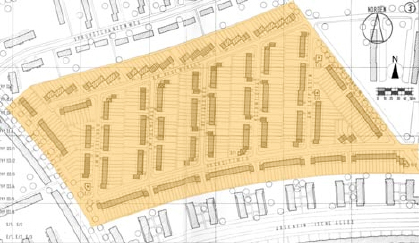 Four great housing estates (called siedlung) were built on the outskirts of the city. 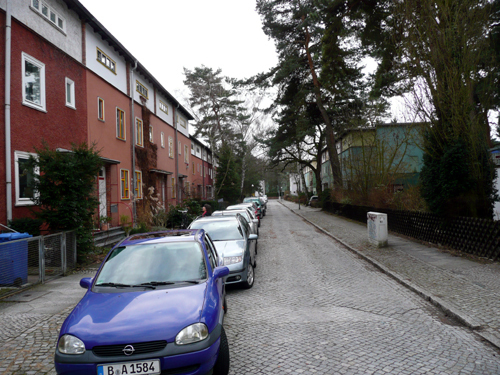 The estate in the Zehlendorf district (Waldsiedlung Zehlendorf)2 better known as Onkel Toms Hütte3 is perhaps the best known. It is well organised spatially, displaying a sensitivity to the shape of the site and greatly enhanced by the use of colour. 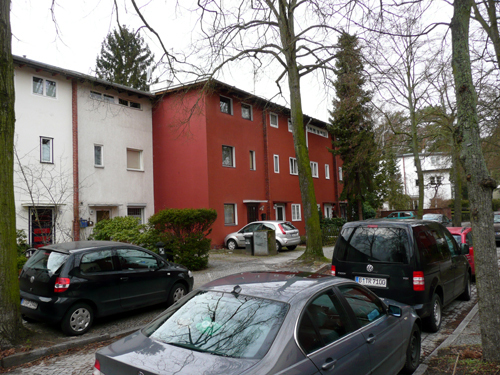 The estate was built between 1926 and 1932 by GEHAG (the public housing board)4 in partnership with the architects Bruno Taut, Hugo Häring and Otto Rudolf Salvisberg. It included a row of shops, post office, restaurant, cinema and U-Bahn station which provided a centre for the estate. 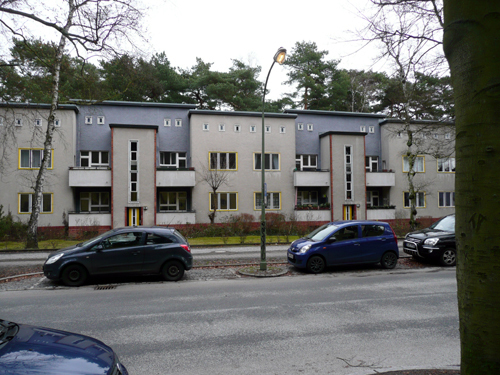 Apartment blocks and three-storey terraced houses (zeilenbau) were grouped north and south of the main road, the Argentinische Allee, which connects it to the city. 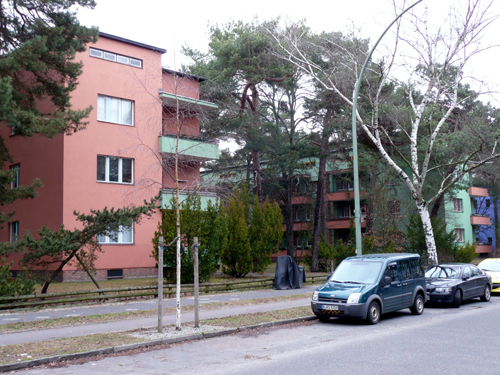 The buildings, integrated into the wooded landscape of pines and silver birches, were kept low in scale – below tree height – and were linked by curved roads and shared green spaces. The west-east roads were built on a curve to provide a picturesque effect and the smaller north-south roads were deliberately built narrow to keep the speed of traffic down. The first phase of the development was built south of the Argentinische Allee and the railway and has a slightly different character to the later work. Colour is used more simply and in larger elements. 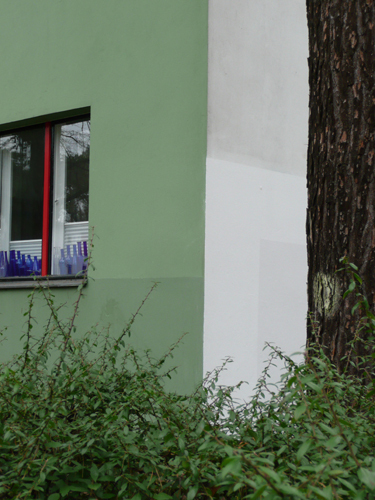 The houses might be painted in variations of a similar colour on one side or in a single colour – just white or blue. The ends of the streets were closed with blocks of colour – for example dark red, blue or white. Further unity was achieved by employing the same pattern front door in dark blue with horizontal red bands. 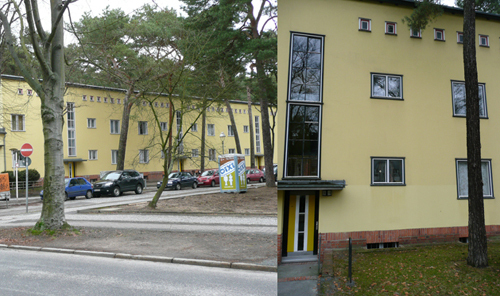 The almost flat façade of the early apartment blocks is a smooth light yellow. The stairwell windows, two floors high, with their black and white window frames break up the surface and prevent monotony. The entrances are marked with front doors of black and white with yellow surrounds. Black and white recessed flat windows form the basic framework and small attic windows in white/red/white add variety and help link the whole unit. Again, monotony is avoided by the apartment block on the other side of the road being almost Cubist in style. The façade protrudes and recedes and is stepped, colour being used to emphasise this articulation. The apartment blocks to the north of the Argentinische Allee alternate red with green balconies and green with red balconies. Blue is also found with white balconies. The larger windows are black/red/black with yellow and red found on the smaller attic ones. The type II house is the most common in this area. 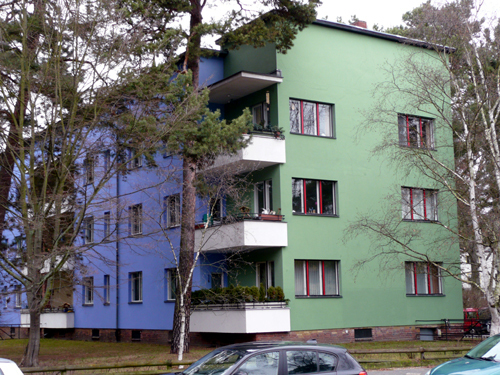 The use of colour on the façades brought identity and variety to the terraces. Variations of a colour were employed along the length of the terrace with a narrow band in a paler colour across the attic storey linking the buildings. Off-white was used on the red buildings and a pale yellow on the green ones. This served at once to strengthen the chromatic effect and reduce the buildings’ height optically. The five north-south streets have façades facing west painted red and those facing east the complementary green. The façades were articulated with bands of brick and the window frames outlined in black and white or red and yellow, the whole effect reminiscent of the work of Piet Mondrian. 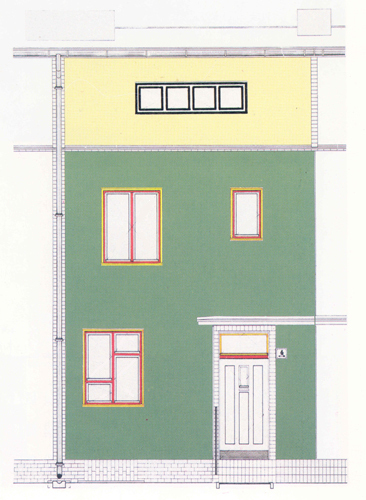 This complementary scheme was reversed on the back of the houses, so that those with a red façade had a green rear elevation and vice-versa. In 1980, Posener, Pitz, Brenne and Portoghesi were commissioned by the Berlin Senate to report on the state of Onkel Toms Hütte. They rejected strict controls on what could or could not be done, but gave recommendations to encourage user initiative and awareness. Their reflections show a great understanding of Taut’s design philosophy: a uniform urban fabric that can be altered. Their suggestions for conservation seem to have had some effect as many of the recently renovated houses show the reinstatement of the original colour scheme. Many of the façades were measured by Patrick and Alex Baty, of Papers and Paints, using a portable spectrophotometer. This means that the colours can be reproduced should there be a demand. It was sad to see that graffiti is obviously a problem and sadder still to see the lack of colour consistency when repainting, with several façades having a patchwork effect (see above). 1Bruno Taut. Rebirth of Colour. 1925. 2Waldsiedlung – literally ‘Forest settlement’. 3Uncle Tom’s Cabin. In 1885 a local landlord named Thomas opened a public house at the southern rim of the Grunewald forest and installed several small huts in his beer garden to shelter his guests from the rain. These huts were referred to as “Tom’s Cabins”, which reminded many of Harriet Beecher Stowe’s 1852 novel Uncle Tom’s Cabin. 4Bruno Taut was the artistic director of its planning division. 5Letter to the city planning authorites, Zehlendorf, from the planning authority archives, Berlin-Zehelendorf. 1930. Martina Düttmann, Friedrich Schmuck and Johannes Uhl. Color in Townscape. W.H. Freeman and Company. San Francisco. 1980. Derek Fraser. Berlin (Buildings of Europe). Manchester University Press. 1997. Michael Lancaster. Colourscape. Academy Editions. 1996. Tai Manu Schomaker. Urban Analysis of Onkel Toms Hütte. British developers could learn a lot from this. Mind you if that had been built in England it would by now look a mess with the introduction of PVC double glazing and stone cladding added in the middle of a terrace.